“Where I grew up in New Jersey, my brother and I used to have a shop nearby us where we could get O-Pee-Chee NHL cards from Canada and we spent a lot of summers mowing lawns so we had money to put sets together. As a child I really enjoyed putting the cards in order by their number and organizing them, but as I grew older I became more intrigued by the statistics on the back. I can honestly say I really developed a love for numbers and math because of the time I spent with my hockey cards over those summers. Chasing packs of hockey cards in my youth was one of my favorite hobbies. “I also learned a love for the art of making a trade. I had friends who collected as well and there was nothing I enjoyed more than trading with them. Those adolescent trading sessions really taught me at a young age how fun it could be to position my assets as something great while downplaying your competitor’s assets in the hopes of making a trade in your favor. I learned to be careful there however; as if I burnt my friends on a deal, their mothers usually would not allow them to make future trades with me. “I learned the importance of developing relationships with my friends on trades, doing research on their assets I thought had upside and giving them something that was marketable today, but may not be in the future in exchange for those under appreciated assets. Basically I traded them stars at the decline of their careers for rookies with upside so it seemed like they were getting the better end of the deal, but in the end it usually worked out in my favor. Yes, some of my childhood friends are still bitter about some of those trades, but they learned something from it too, do your homework before heading into a negotiation. “In high school I found out about girls and I put my collecting on the shelf for a bit. When I went to St. John’s University, like any struggling college student, I found myself looking for ways I could make some extra income. And as difficult as it was, I was able to sell quite a bit of my collection, most of which for a nice profit considering how well I took care of my cards. While I had the opportunity to learn a little bit of a stock market type of experience in those early deals with my friends, dealing with adults in selling my cards brought a whole new type of excitement. They were not as naïve as the kids I grew up with so it presented new challenges where I had to go up against some very shrewd negotiators. I learned a lot of great lessons in those deals, but because I had invested pretty wisely, I ended up making some good money to help me through college while being able to hang on to some of my favorite hockey cards. Hockey has always been a passion of mine. 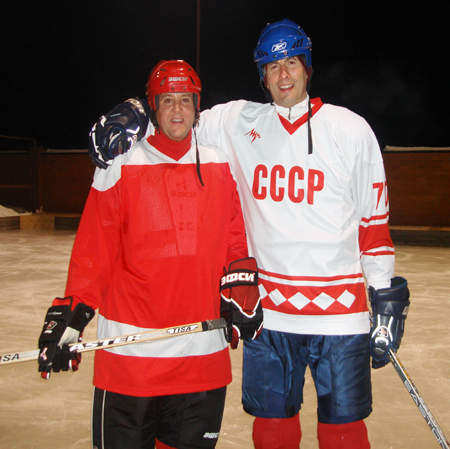 I even like to play on vacations like this one in Russia. 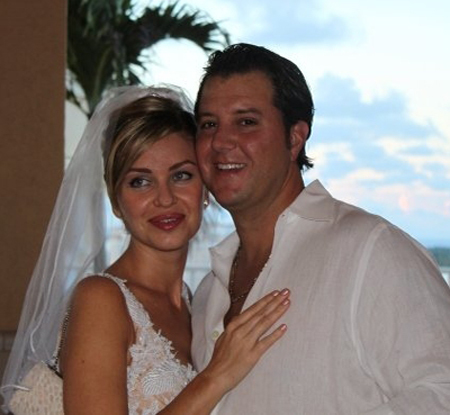 “After college I began a long and lucrative career in the finance industry. I am now the CEO and Founder of GLX – Global Listing Exchange, the world’s first Global Online Investment Community. 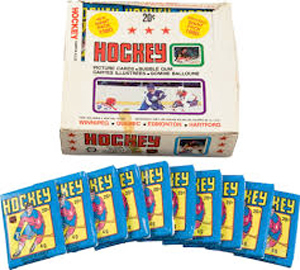 And while I stopped trading cards and started trading equities and commodities, I’ll never forget what a big role hockey cards played in my life. Now that I am a father, I am hopeful my kids will enjoy the hobby like I did. I still have some of the cards I collected growing up along with some new ones I pick up from time to time when I see them. I’m excited to share those with my kids as they get older and to hopefully see the cards play a role in their development as well, maybe inspiring their future career path. Now that I’m married and our family is growing, I’m excited to share the hobby that gave me so much with my kids when they get older!